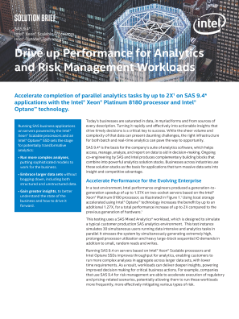 Intel® Xeon® Scalable processors and Intel® Optane™ SSDs accelerate SAS 9.4 parallel analytics tasks for potentially transformative analytics. Faster SAS analytics lead to improved data mining, statistical analysis, and forecasting. Run more complex analyses using sophisticated models. Embrace larger data sets without bogging down, including both structured and unstructured data. Gain greater ...insights, to better understand the state of your business and how to drive it forward. This solution brief explains the details behind these advances.